Day three of getting up ridiculously early, it must be Disney Marathon Weekend. The 2:30 am alarm went off way too early this morning but we both got up. 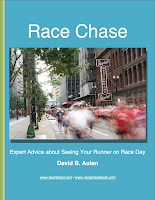 This time I was the only one running while Dave was going to have a long day of cheering. Once again we drove from the Boardwalk at 3:15 and got to the Epcot parking lot pretty quickly. 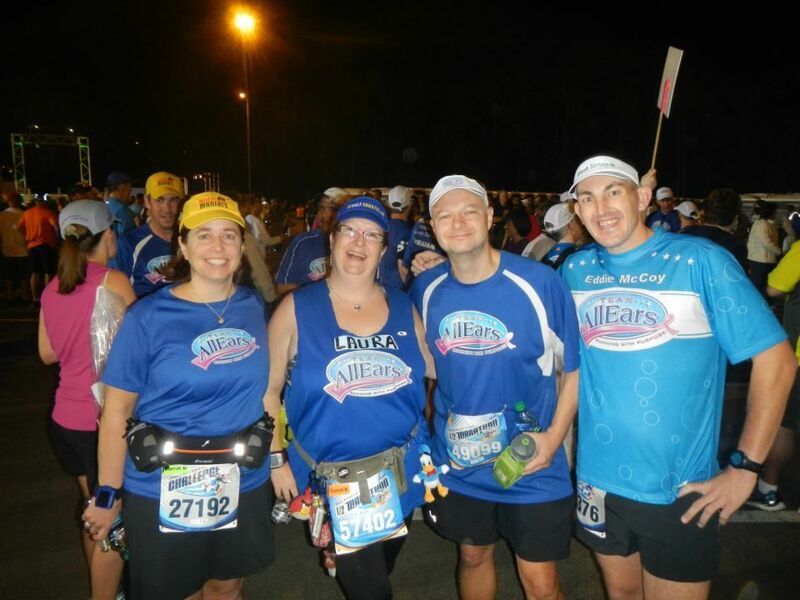 We met up with Team AllEars as well as our friend Jim who was doing his first marathon. This time right after the team picture I headed to the corrals. It went much quicker since I left earlier. 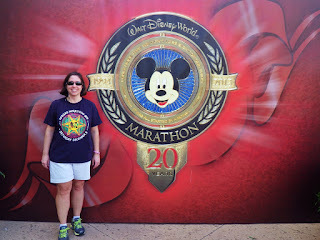 I actually had some time to sit in the corral before the start. 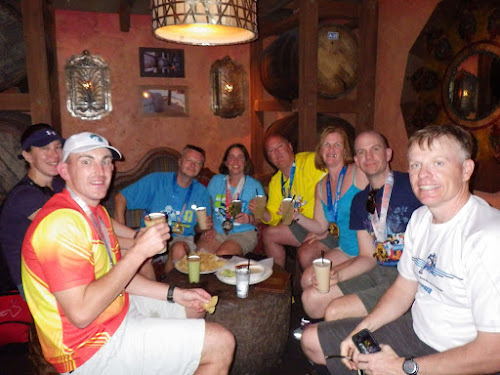 I had quite a few of the Team AllEars teammates with me in Corral D. We were all worried about the heat later in the race and all decided just to relax and have fun. The first few miles went great. The Magic Kingdom was fun as always and over much too quickly. 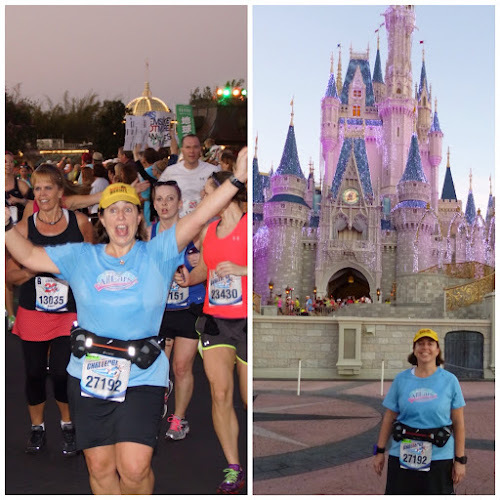 This was a new course for the Marathon and I wasn’t used to being only at Mile 6 when leaving the Kingdom. We headed into the Speedway for the first time and I can’t say I loved it. I didn’t like the big downhill and big uphill to get in and out of the Speedway. It was hard on the knees. 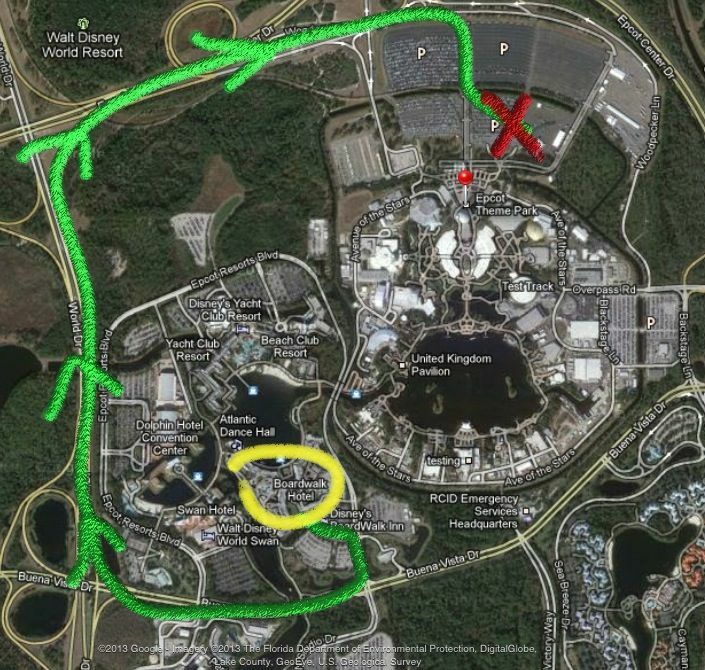 Next up is one of the boring stretches of the course, the back road to Animal Kingdom. Luckily Michael Miller showed up right as we exited the Speedway and we ran the whole way through this section together and it helped it go by much more quickly. Thanks Mike! We hit the halfway point in Animal Kingdom and I ran into Joe Taricani from The Marathon Show. I was interviewed and made it on his show and got to run with his sign. That was definitely a highlight. 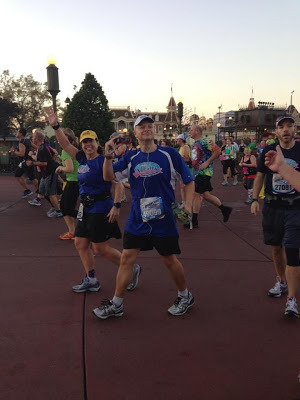 I was still running with Mike and now William Vangroll joined us and Helen Dunn and Rich Gairing were also around us as well. It was really getting warm now. For this race I decided to try the Powerade on the course instead of carrying my own Heed to get me through the race. Big mistake. 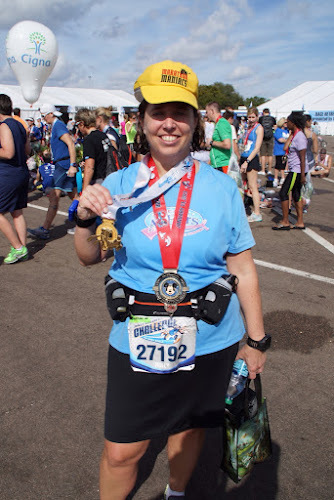 I started having stomach issues around mile 18 or so. I had to stop and walk to try and get my stomach to calm down. It worked but I lost my running mates. This was a bummer as they sure did have a fun time for those last miles. This was when we entered the Wide World of Sports Complex and the supposed Mile 20 Spectacular. It was most definitely not spectacular. I was very disappointed. 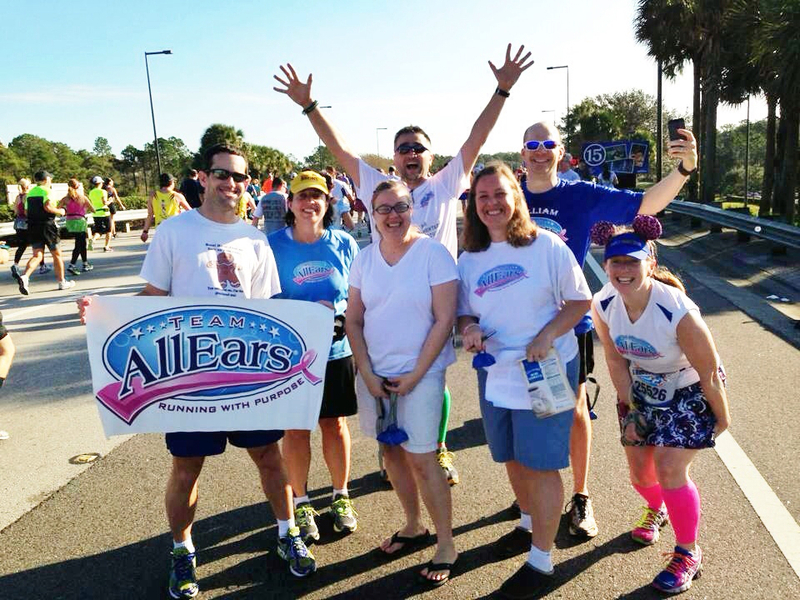 The last few miles were a struggle, but the amazing Cheer stations from Team AllEars got me through! Dave also had a delicious cold beer for me right when I got to Epcot. But can I just say that that was the longest lap around the World Showcase I have ever made? For every other marathon that has been the victory lap and just a blast, not this time. I was done. I was very happy to finally see the Finish line. This was a tough Goofy due to the heat. 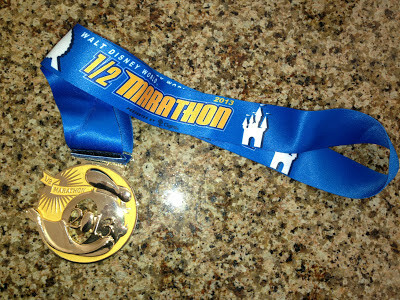 It was my second worst Marathon time out of 17 tries. But it doesn’t matter. I finished and I even had a smile on my face. 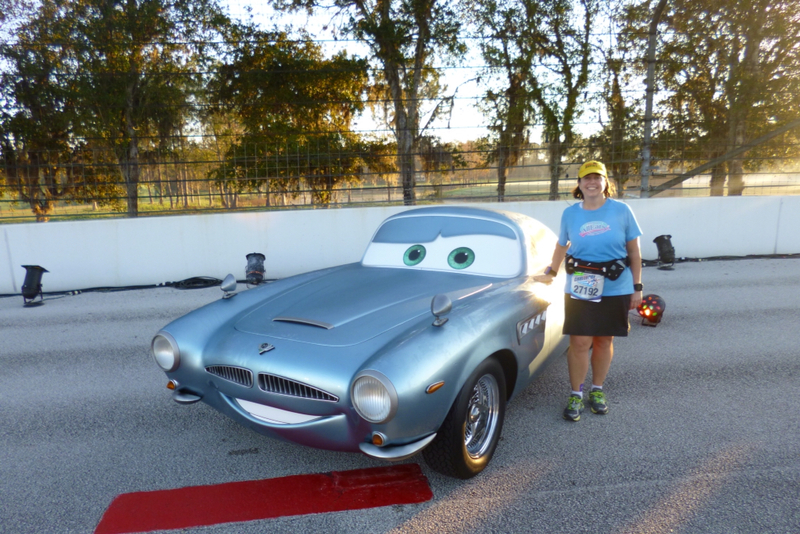 That will wrap up the Walt Disney World races. 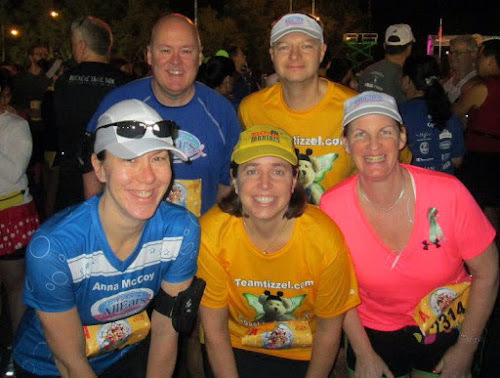 Next up: Disneyland's Tinker Bell Half Marathon Weekend races and The RunDisney Coast to Coast Challenge, then the non-race portions of both coasts. 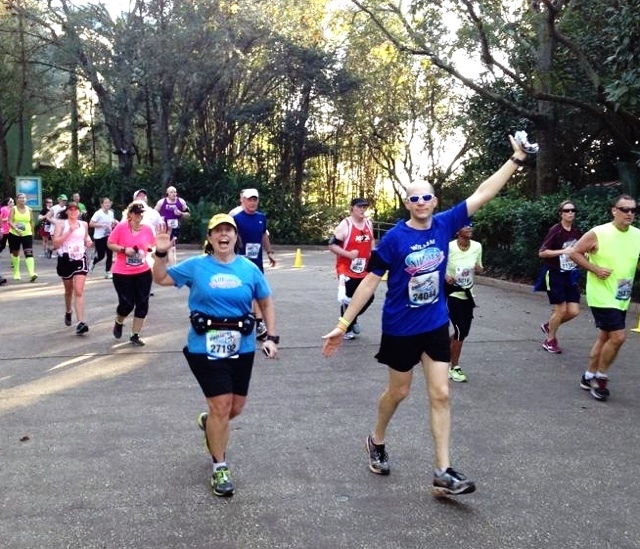 Note: With this being Dave's first half marathon, we'll leave all of his thoughts on that topic for another post and try to keep this report as focused on the race as possible. You know it's Disney race season when you have 3 alarms and a wake-up call set for 2:30am. 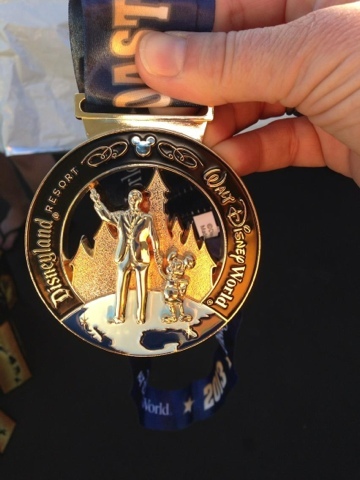 The Walt Disney World Half Marathon takes place on the Saturday (this year January 12) of the WDW Marathon Weekend. 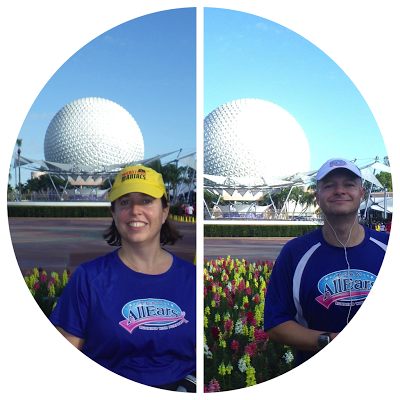 We were out out the door by 3:15 and drove over from the Boardwalk Hotel to Epcot. We really like the Boardwalk for Marathon Weekend because of the ease of driving to the race start area. Usually takes us about ten minutes. Once we got to the Runner's Village we met up with Team AllEars for conversation, group photo, pep talk, and corral matching. If you want to hang out in the corrals with friends you either need to leave together or keep in constant contact. Disney will start suggesting you leave for corrals starting at 4am for a 5:35 race start. 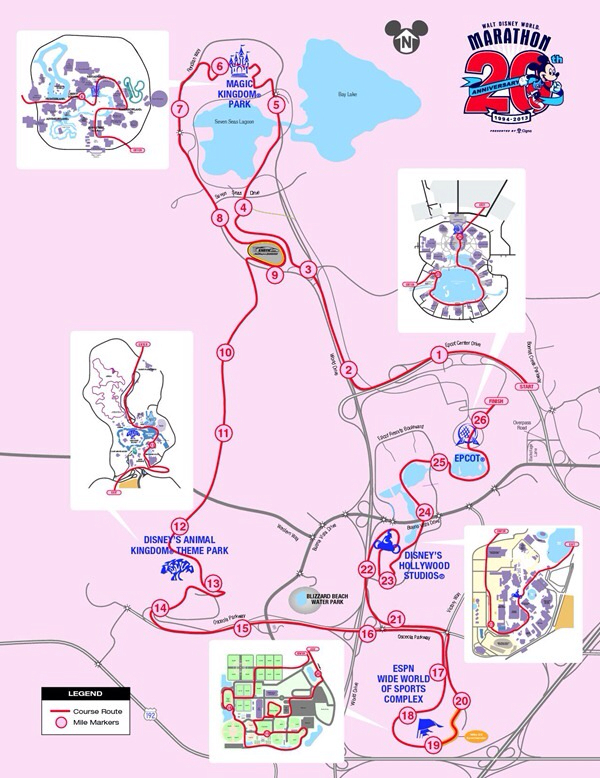 The walk is just about a mile from the Runner's Village. We left around 4:20 or so and it took over an hour to get in our corral. We were in a sea of humanity (25,000 racers) squished together on a slow waddle to the start line. We made it to our corral when the National Anthem kicked off. 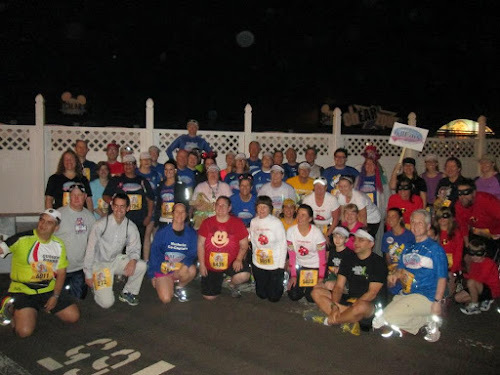 We were in Corral E which meant we would actually start the race around 6am. Each corral was sent off with fireworks. Drew Carey, star TV's The Price is Right, was at the start waving hello to the runners. At 6am the course is still pretty dark. 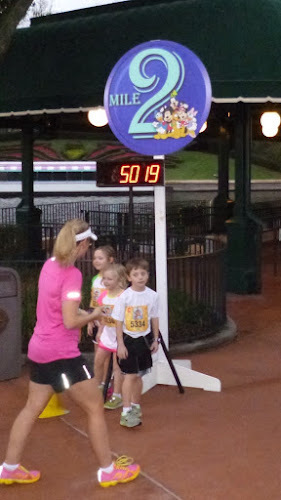 Disney had some generator lamps brought in to supplement the other street lamps, but for our pace it remained mostly dark until around mile 4. We decided at the beginning to run our own races which meant Holly would go faster than Dave. 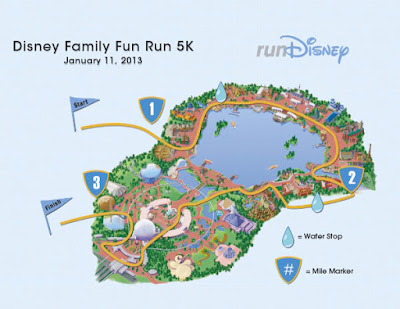 Disney strives to entertain runners the whole way. Between Miles 0 and 4 we saw high school bands, Chip and Dale with NASCARs, Jack Sparrow and a pirate ship, Jack Skellington and Sally, and kites. Yes, mile two's entertainment was people flying kites - in the dark. At Mile 4 we hit the Transportation and Ticket Center (TTC), which is the first large spectator area along the course. Right before hitting TTC Dave passed Holly while she was standing on line for a Jack Skellington photo opp. 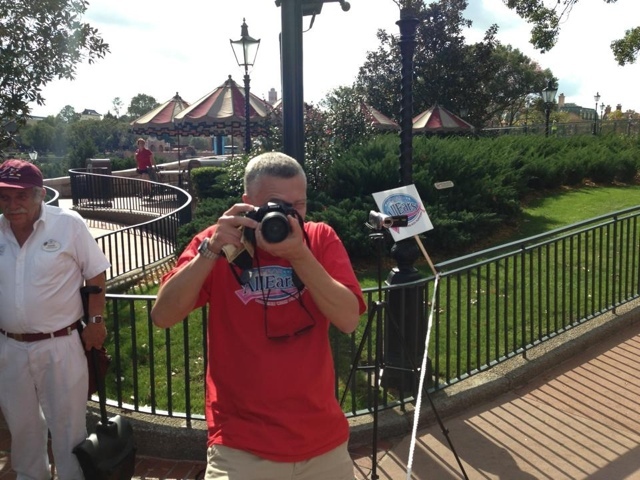 Our friend Dan met up with him at TTC and they traveled together towards the Magic Kingdom. Right around Mile Marker 5 Holly caught up and we entered Magic Kingdom together. At the very end of the hub/Tomorrowland Bridge we ran into our Team AllEars cheer section and found our friend Amanda there. We traveled Tomorrowland and Fantasyland together and started going through the back of the castle to Main Street. Usually people have the opportunity to run through the front of the castle. 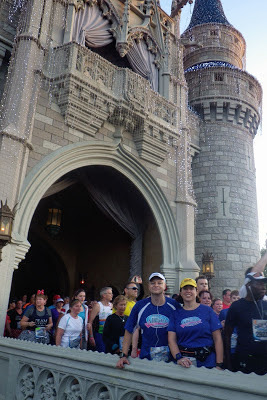 We stopped dead halfway through the castle, because the course was so congested, and started walking through at the same pace we walked to the start line. 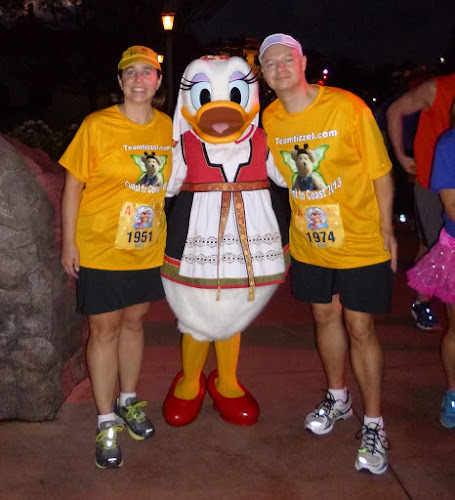 In Liberty Square/Frontierland we split up to continue running our own races. As we entered backstage we found the princess parade float for a photo opp and the 10k marker. After leaving the backstage area there was a good two mile stretch of narrow course. We never really thought about how many one way roads there were on property. When you cone-off all those roads to divide them in half it creates a crowded situation. During this time we were passing The Grand Floridian, Polynesian, the speedway, and a golf course. There was a Lilo and Stitch photo opp and some fake wedding by the wedding pavilion. A bit after mile 8 the course opened up as we approached World Drive for the return trip. This is the time we started really feeling it warm up. Miles 8 - 12 are pretty much wide open streets with no sun protection. 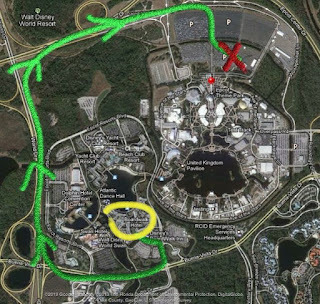 Disney did a great job with water/Powerade stops a little over a mile apart from each other. After mile ten some uphill work starts. Time to take a steep exit up to an overpass. This ended up another slow bottleneck area. Coming into Mile 11 was a nice downhill complete with entertainment by more kites. Dave spent some time here with friends Tom and Molly. As racers go down the hill they can see the next step is a hairpin turn up to another ramp. Holly spotted Dave from the ramp - must have been 4-5 minutes apart. We were separately greeted on the overpass by our friends Eddie and Mike. They finished the race and came back through to cheer for folks. When you get to this final overpass Spaceship Earth (the ball thingy in Epcot) looks pretty close and you get the feeling it is almost over. Before getting into Epcot and Mile 12 there was a Phineas and Ferb meetup and a large spectating area. 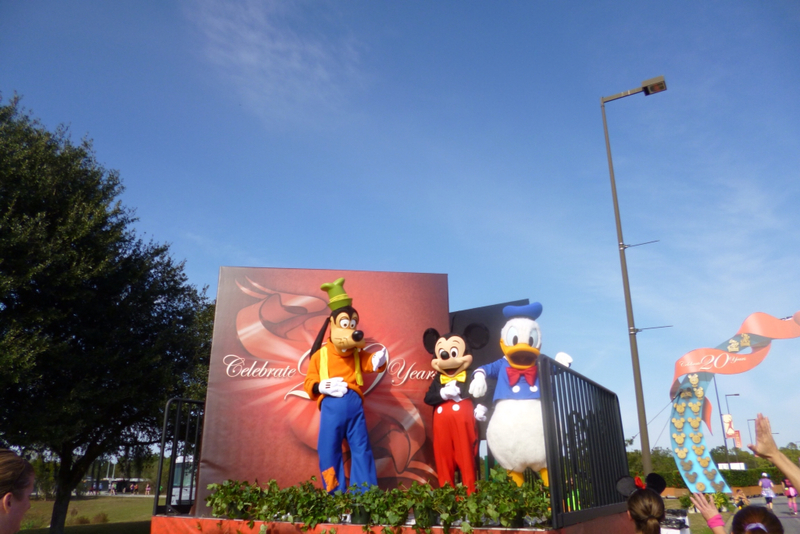 We saw lots of friends cheering on the runners at this location. Dave met up with Holly just after entering Epcot. We did the last mile together through Future World. 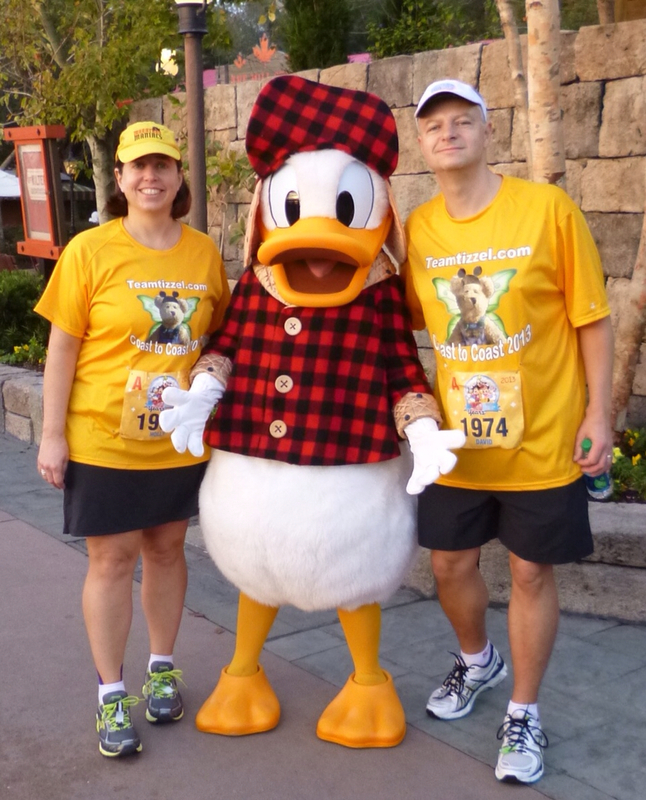 We stopped for a picture of two and looked for a Duffy photo opp, but there was no Duffy today. 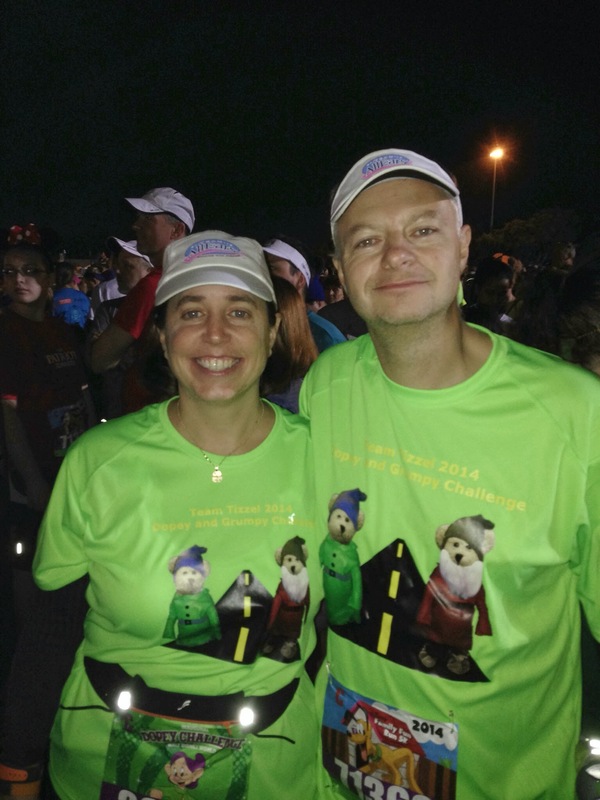 We crossed together with a time around 3 hours 12 minutes and were met at the finish line by our friends Faye and Jim. 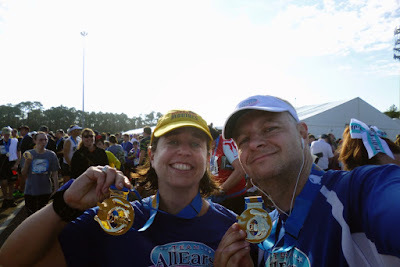 We drove back to The Boardwalk, showered (Dave had a beer to celebrate his first half marathon finish), went into Epcot for a World Showcase lap, went to our Team AllEars meet in The Dolphin. 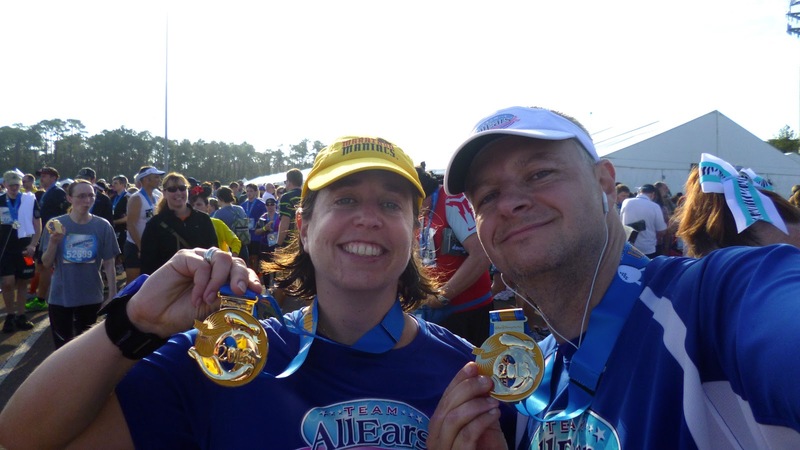 At our Team AllEars meet we learned the team had raised over $78,000. Since Team Tizzel was the highest raising team we got to be part of the reveal and it was an honor. After the meet it was back to Epcot for dinner at Tutto Italia with our friends Faye and Jim. We called it an early evening since another 2:30 wake up call was coming for Holly and Jim to run the marathon the next morning. 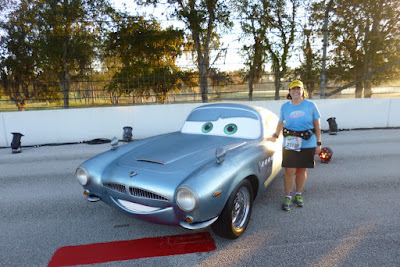 Overall RunDisney put on another great race. The one complaint we really have for the half relates to the overall crowd levels and bottlenecks. With that aside we both had a fun time during the race. Next up, Holly's report on Sunday's Marathon/finish to the Goofy Challenge. In California for the 2nd half of our Coast to Coast Challenge. 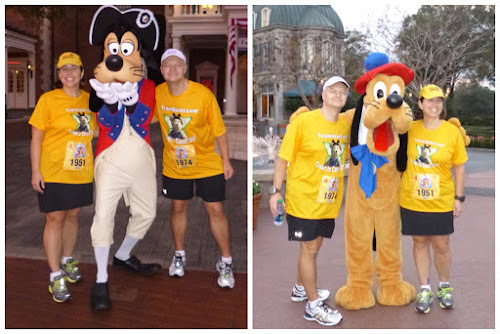 The Never Land 5k was awesome! 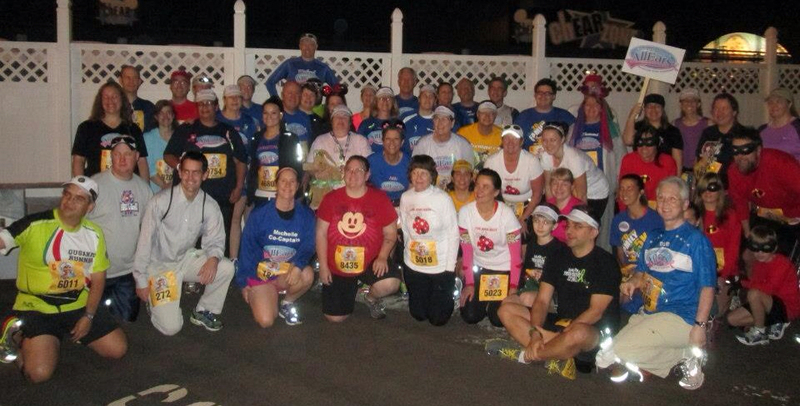 Best Disney 5k ever. More details in the future, but here are some pictures. The first race of our 2013 Coast to Coast Challenge was the Family 5K. This race starts in Epcot's parking lot and follows a route into the park for a trip around World Showcase and part of Future World. This was our fourth time doing this race and we've watched the number of participants almost double to 10,000 people this year. 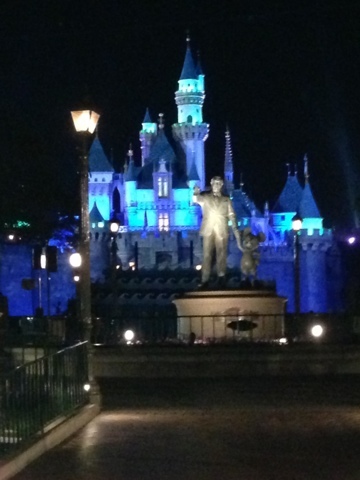 Amazingly, Disney had a good corral system figured out and everything seemed to go smoothly. We were also lucky to be in Corral A (assigned based on registration date). The morning started off with a 4:15am wake up call and quick drive to Epcot from our hotel, The Boardwalk. 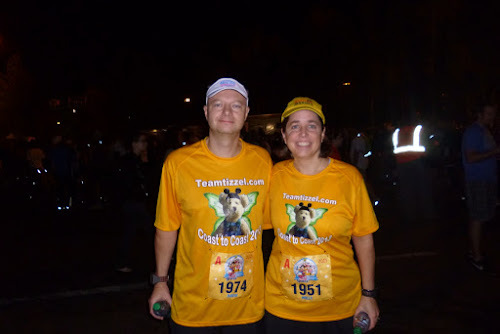 We wore our new Teamtizzel.com shirts we made specifically for these two weekends. Since Dave wore a Duffy outfit last year alot of our friends were confusing Tizzel with Duffy. We joined the rest of our Team AllEars friends and had fun chatting with everyone. We assembled for the team photo then took off for the corral. 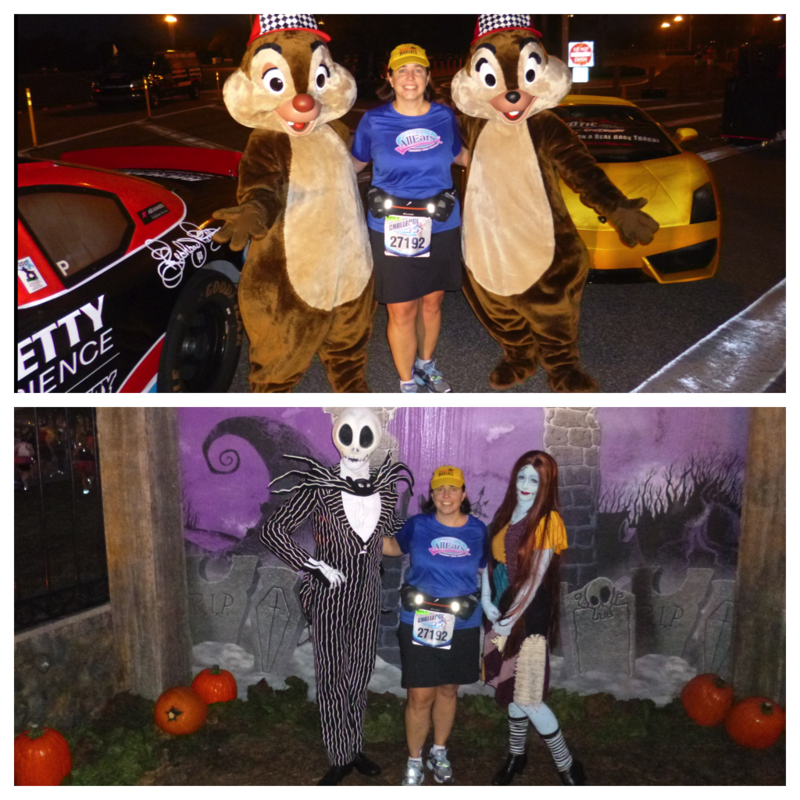 We had a great time hanging out with our friends before the race. When the fireworks went off it was race time! We made sure we said hi to our friend, the race announcer, Rudy Novotny. The first mile plus of this race is boring. It's parking lot and woods. Occasionally you will pass junk, like a Jungle Cruise boat, but that is it. Usually we stroll this whole race. Dave had the bright idea of picking up the pace so we could get to the good stuff quicker. Mile one was completed within the 16 minute range - last year we were in the 20 minute range. The fun begins once you come out of the Mexico Pavilion. Our first character sighting was Daisy Duck in her Norway outfit. That was different. The line was long, but we got through quickly. 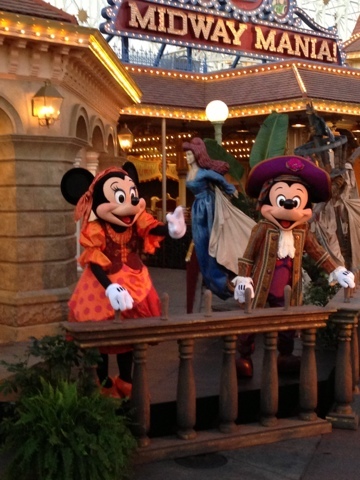 Next character sighting was in the American Pavilion. Colonial Goofy. Yet another long line. In France we visited French Pluto. Still lots of people flowing through the course. We had fun talking to friends as we passed each other. Yes that clock means a 32 minute mile. Mile 3 had one more character stop. It was Canadian Donald. After stopping for that picture we made our way into Future World. We were tapped on the shoulders by our good friends Faye and Jim. 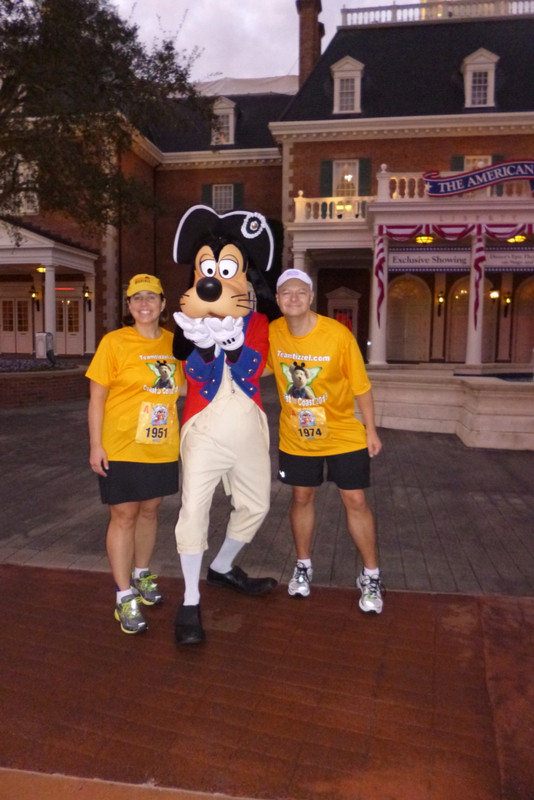 They started in Corral D and maintained the required course pace and caught us. Fun! We passed the mile 3 marker indicating a 1:13 time. We were now about 5 minutes behind last year's time. 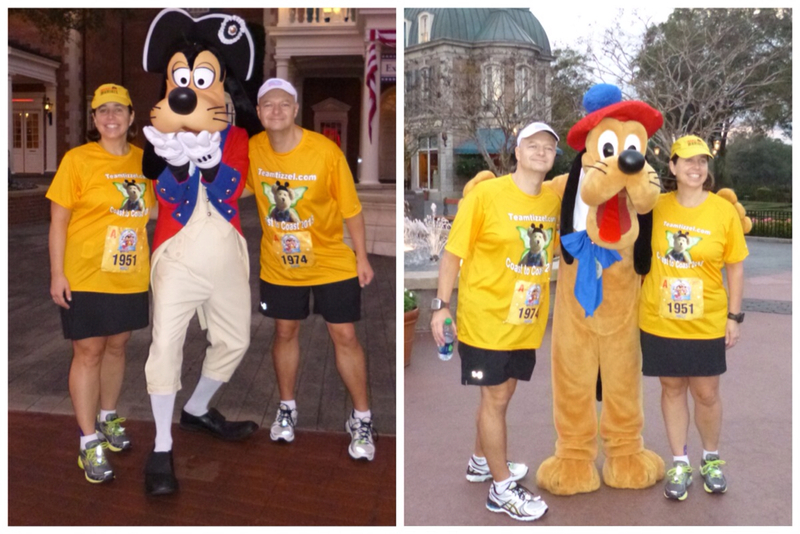 The four of us crossed the finish together and got some great pictures. 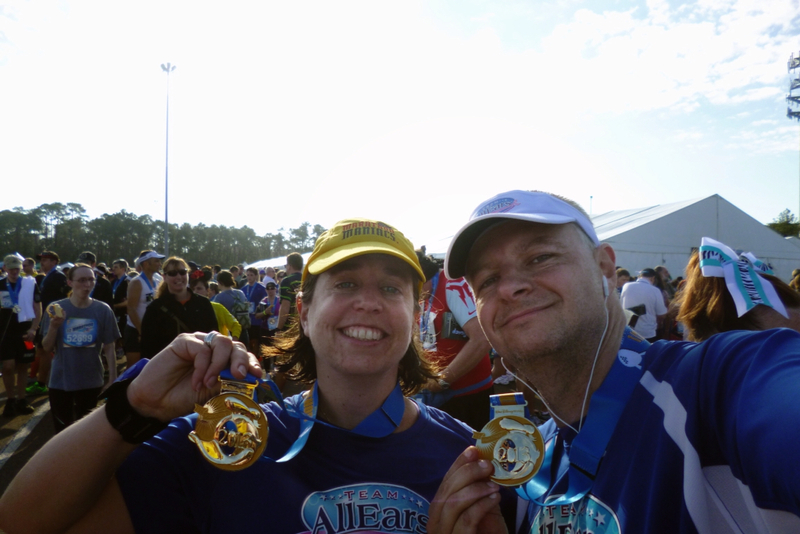 Once we got our medallions we headed back to the Team AllEars Cheer section to welcome the rest of the runners in. 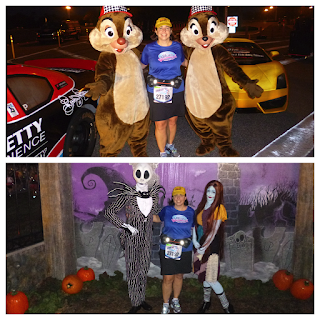 We stayed until all the runners came in to the finish area. All-in-all another fun 5k. Here's a quick Marathon update. Holly finished. The course was extremely hot, making this one a challenge. We'll have more in a future post. 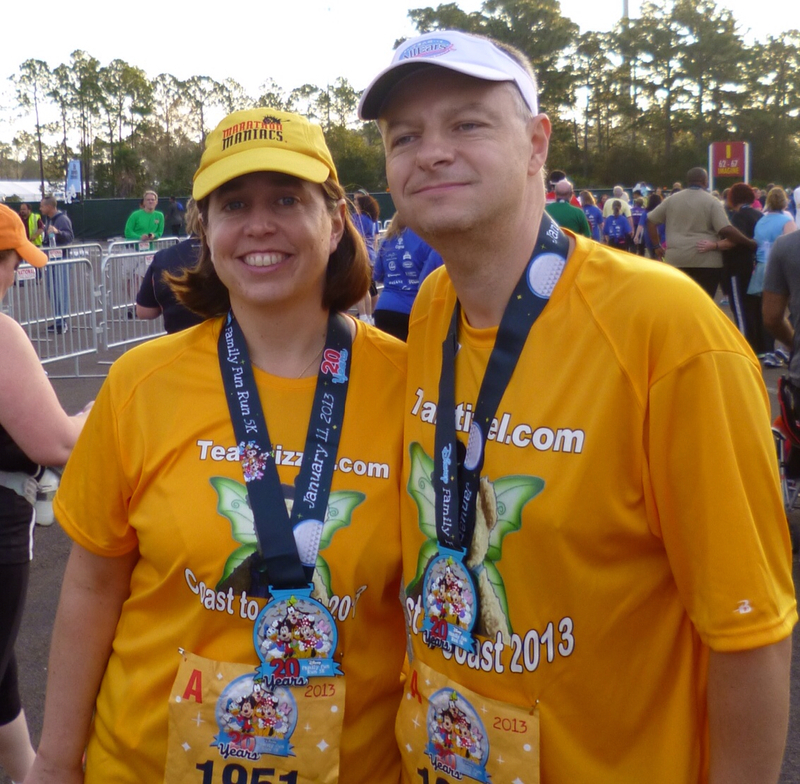 This morning was Day 2 of our 2013 Coast to Coast Challenge. Half Marathon Day. We will save the details for another post, but wanted to let you know that we both finished smiling and crossed the finish line together. Today was our Team AllEars meet. We learned that our team raised over $78,000 this year with more coming in. 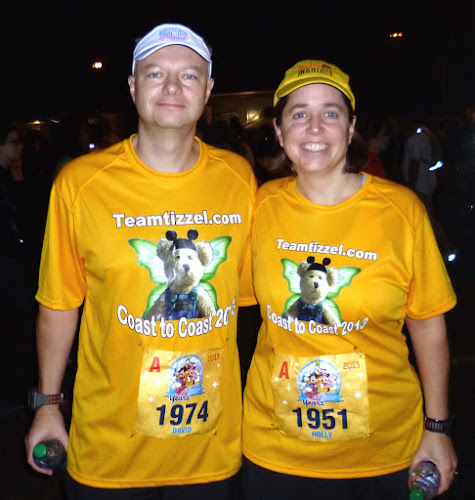 Holly and Dave as Team Tizzel raised $6,700! Thank you all! We were fortunate enough to be part of the team total reveal. It was a bit emotional for us. This morning was Day 1 of our 2013 Coast to Coast Challenge. Kicking it off was the Family 5K around Epcot. We had a great time and stopped for all the character pictures (good outfits this year). This gave us a finish time of around an hour and 13 minutes. As a bonus! we got to finish with our friends Faye and Jim. Faye was the first person to hire Dave for a job. 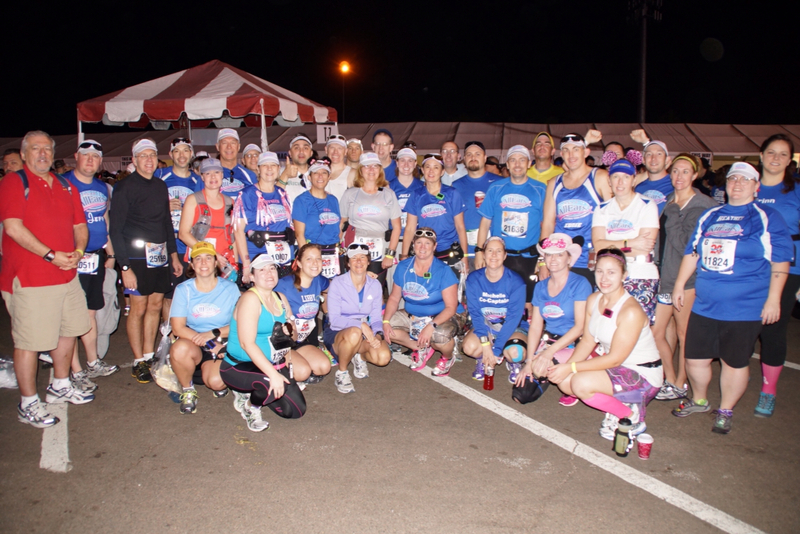 Lots of fun to share the finish line with them and spend time with our Team AllEars family. Why do I Run so many Marathons in a Year?